In this critical article, the authors have reviewed numerous studies in order to elucidate the mechanism of action of the highly purified diethylene glycol monoethyl ether TRANSCUTOL® on skin penetration and permeation. In this study the authors developped stable anhydrous and hydrous creams containing 40% Transcutol® HP, using predictive techniques to select appropriate excipients. Development of a daphnetin transdermal patch using chemical enhancer strategy: insights of the enhancement effect of Transcutol P and the assessment of pharmacodynamics. Shen M, Liu C, Wan X, Farah N, Fang L.
Drug Dev Ind Pharm. 2018 Oct;44(10):1642-1649. doi: 10.1080/03639045.2018.1483391. Epub 2018 Jul 2. A patch for transdermal delivery of daphnetin was developped using Transcutol® P as permeation enhancer. 10% Transcutol® P led to a significant increase in drug release from the patch. This white paper describes Transcutol®, the highest purified pharmaceutical grade of Diethylene Glyceryl monoEthylEther (DEGEE). 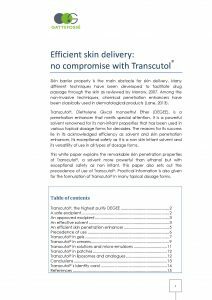 Scientific publications asserting the safety of Transcutol® are listed to highlight the non-skin irritant property of Transcutol®. Moreover, solvent properties of Transcutol® are described and solubility data in different solvents are given to illustrate the remarkable solvent capacity of Transcutol®. This exceptional safety and solvent property make Transcutol® an ideal chemical penetration enhancer for topical formulations, where efficiency and non skin irritancy are key success factors. Examples of commercial uses of DEGEE are cited to illustrate the versatility of use of this excipient in many different topical dosage forms. Practical information is also given for the formulation of Transcutol® in many topical dosage forms.